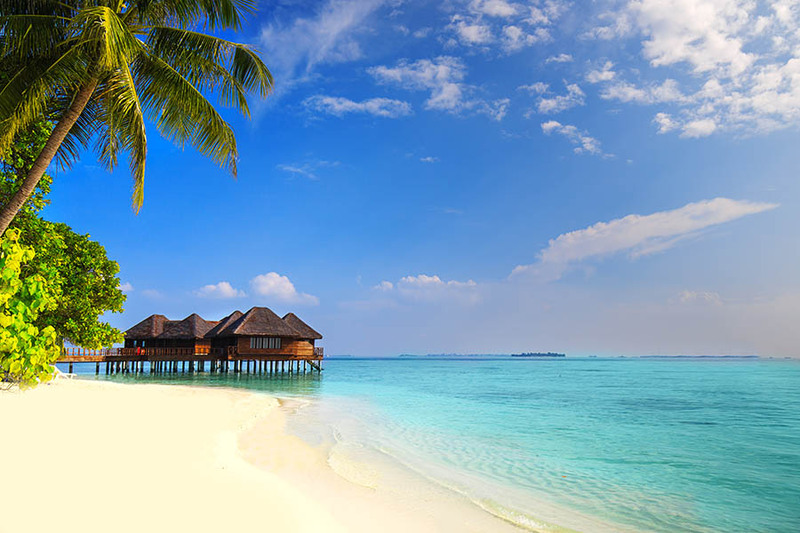 Imagine for a moment; paradise islands fringed by coral, where white sands slope into stunning turquoise lagoons; towering volcanic peaks wrapped in swathes of lush green forest; crystal clear waters in every shade of blue that teeming with sea life. That’s exactly what you’ll experience in French Polynesia. In October, I was lucky enough to visit French Polynesia’s Society Island on the 5-star, all-inclusive Paul Gauguin Bora Bora cruise which I soon discovered is pretty much the ideal way to explore. 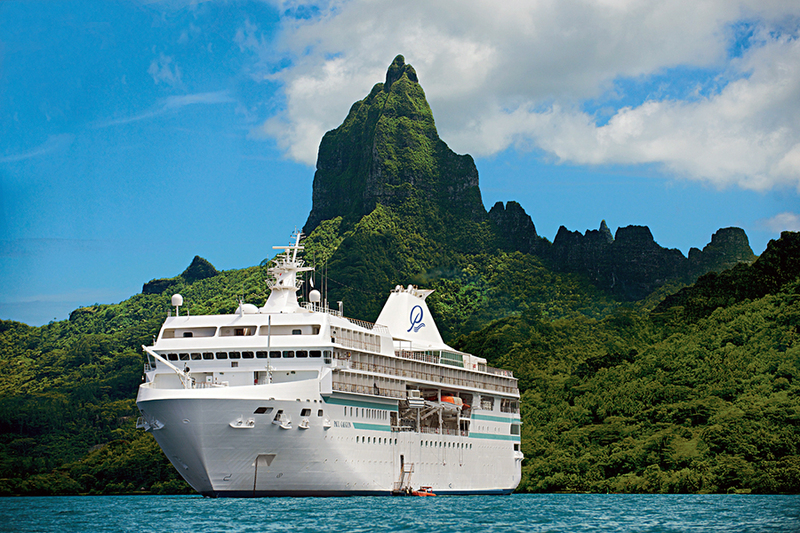 If you’re planning to visit Tahiti and several other islands and you have a budget for 4-5 star hotels budget, I recommend considering the Paul Gauguin cruise. It represents great value, and this kind of small-ship cruise is one of the best ways to jump off and explore these islands. The MS Paul Gauguin is a small ship for up to 332 passengers and 217 staff with one of the highest ratios of staff to clients of any luxury cruise ship - so you’ll be well attended to! The service is indeed amazing and I was pleased to discover the staff knew my name straight away. I thought meals might be a little formal, but I was pleasantly surprised; evening dress is smart casual with collars being recommended for men. Dinner had a laid-back Pacific Islands vibe and the staff were so friendly that you felt more like family than guests. The ship is specifically designed to navigate the shallow reefs of French Polynesia, which means it can get closer to the islands. All of the sailing is done at night, so you have the maximum amount of the daytime to explore. The ship has three restaurants; L’Etoile, The Veranda (which you need to pre-book) and the Grill, each offering either set menus or menu choices that change each day. Every restaurant is amazing and we had a choice of fresh fish, lobster and huge prawns to incredible steak, vegetarian selections and pasta. Breakfast and lunch are generally served buffet-style with huge selections, followed by an a la carte menu in the evening. As the cruise is all-inclusive, we attempted to sample the vast selection of drinks available – and I can confirm that the cocktails, wine, spirits and beer are of the highest quality. Interestingly, unlike some other cruises, there is no surcharge for premium drink brands. There is plenty to keep you occupied on board – you can choose from quizzes and bingo, table tennis, crazy golf, board games, a casino, and educational talks about the different islands. In the evening, there is entertainment which includes live music and local Polynesian dancers. There’s also a spa and hairdresser as well as a small gym, which I occasionally used - just to try and burn off the number of calories I consumed from all the tasty food! The cruise includes a number of tours, and others are payable locally if you choose. Some are free, and several were around USD$100 pp - with options like a scenic helicopter flight costing several hundred dollars. There is something for everyone, especially when it comes to discovering marine life. Options included scuba diving and snorkelling as well as aqua bikes, an underwater walk, and glass-bottomed boat – so no matter how confident or active you feel, there is a way to explore. This ship has nine decks, and I stayed in a Balcony Category C room on Deck 7. It was incredible to wake up every morning, stand on the balcony and catch a stunning sunrise over a new island, or in the evenings, watch the sunset with a drink as we set sail. I highly recommend the balcony rooms; our room was spacious, comfortable and far bigger than I expected from a cruise ship. If you’re after a suite, some of the biggest are situated on deck 8 and are these are super spacious and luxurious. Regarding location within the ship – the mid-ship cabins experience less sensation of movement when sailing overnight. I sailed on a 7-night cruise around the Society Islands and Tahiti Iti, which is a new route that begins in Papeete, Tahiti, then sails to Moorea, Huahine, Taha'a, Bora Bora, Vairao and back to Papeete. As the ship does all of its cruising at night, we set sail for nearby Tahiti Iti (the smaller island of Tahiti) at night. When we awoke, we had marvellous views over hills covered in lush vegetation and the sound of surf breaking over the surrounding reefs – absolute bliss! As I’m not one for sitting still, I decided to make the most of the complimentary kayaks and paddleboards you can use, so I went out by kayak a few times. I also paid for an excursion to Surf Point which is well worth $95pp. You visit the world-famous Teahupoo wave, which is on the international surf competition circuit, and we did spot a surfer successfully ride this awe-inspiring surf. They also take you to the southern end of Tahiti Iti, where there are no roads, where you stop off at a fishery and a snorkel point. Here we had our first of many sightings of humpback whales! The next day we woke to find ourselves anchored in a calm bay, on the island of Huahine. We decided to take the free boat tender to shore, then after a 20-minute local truck ride, found ourselves in a small town with a beautiful beach. We spent some time on the beach and in the sea in the morning, then stayed for a local lunch and beer before heading back to the ship and taking the paddleboards out in the very flat, beautiful bay. Day three brought us to Taha’a and my favourite day of the whole trip. You’ll be dropped off at a private island owned by the cruise company, where you’ll be treated to cocktails in coconuts and an amazing BBQ feast! This was a genuinely unique day and something you won’t experience by staying in hotels. Whilst you’re here, most of the activities on offer are water-based, like kayaking and snorkelling. As with everywhere we visited in the islands, the water was clear, turquoise and stunning. 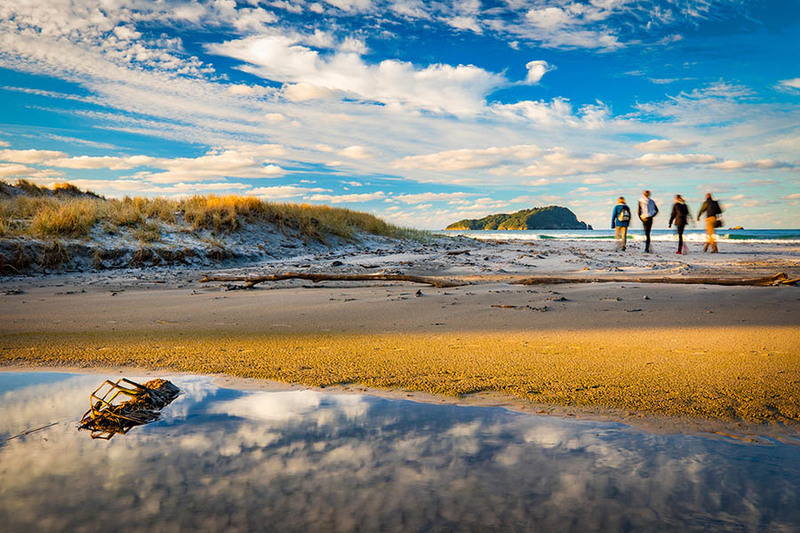 I managed to fit in one of my favourite activities when travelling; going for a solo run on a beautiful beach and exploring little bays and coastlines with no one around. In the afternoon, a couple of us went exploring. You can snorkel to a tiny island, walk across it in about a minute, then swim to another island. With no-one around, we felt completely alone as we island hopped in paradise. A real Robinson Crusoe moment. Today we awoke to views of Bora Bora’s famous volcano, Mount Otemanu towering over the smaller islands. I went to check out two if the island’s most popular hotels, the 4-star InterContinental Le Moana and the 5-star InterContinental Thalasso. If you’re visiting Bora Bora on the Paul Gauguin cruise, the staff on board can book you for a meal or an overnight stay in the Intercontinental Thalasso’s ionic overwater bungalows. 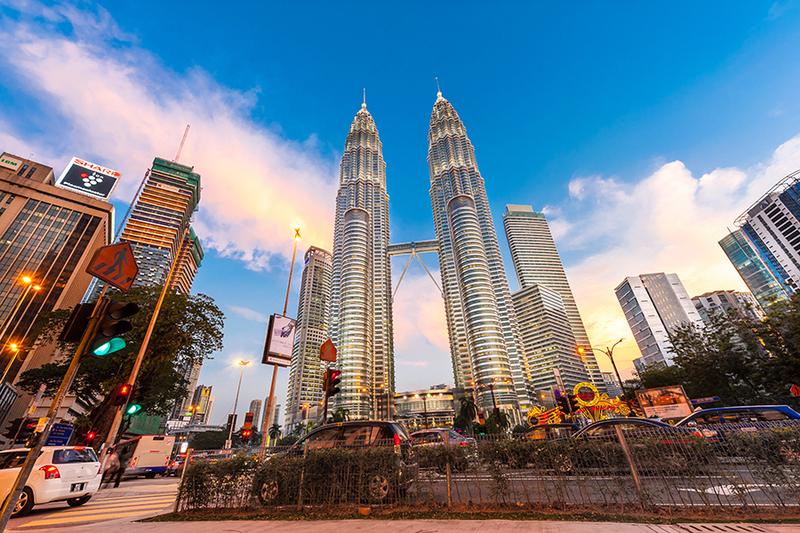 Although a stay is not cheap, it’s a really special addition for a celebration holiday and worth considering given the truly spectacular views you’ll have. 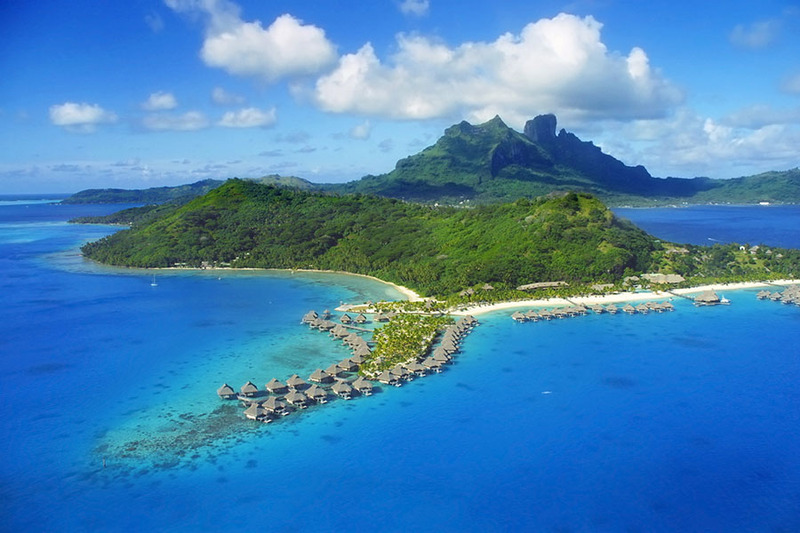 Le Moana is on the southern tip of Bora Bora’s main island, beside the beautiful Matira beach (a public beach). 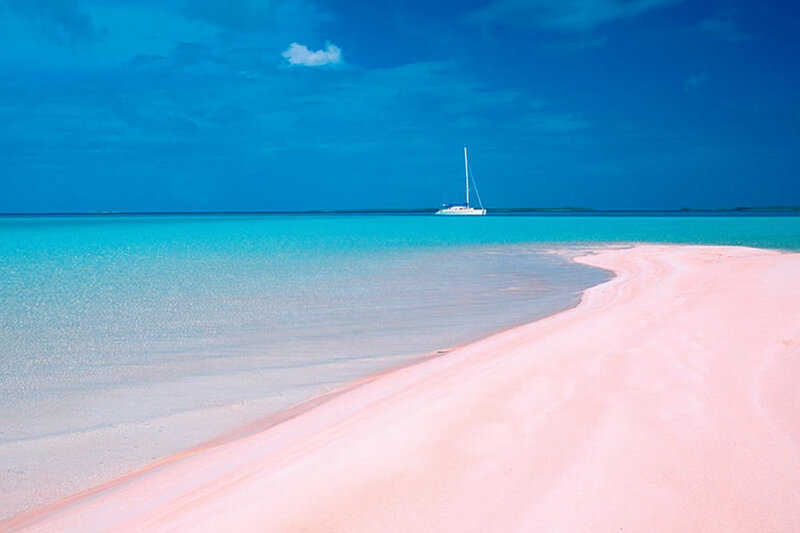 It’s a mile-long stretch of soft white sand that slopes into the sapphire lagoon. You can wade through the lagoon for what seems like miles with the water at your waist height. 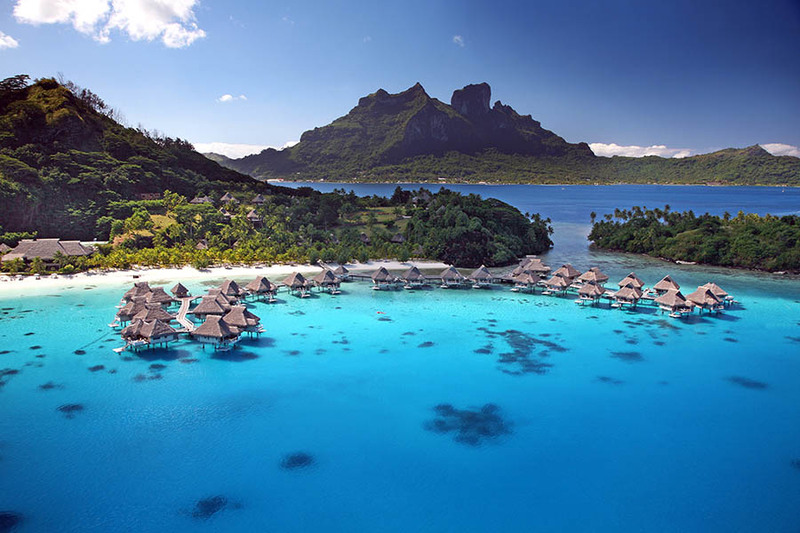 Next, I took a boat to the InterContinental Thalasso, where I was greeted by that incredible picture-postcard image of Bora Bora I had been imagining. The Thalasso is a string of overwater bungalows sits on a private beach facing into the lagoon and towards the volcano. The views of the volcano from here are absolutely superb, with the pointed peak overlooking the stunning lagoon. On leaving the Thalasso, I had arranged a dive. I chose Top Dive who have bases are based at several of the islands and they offer some amazing dive packages which you can spread between the islands if you’re visiting a few different places. You can also arrange scuba diving onboard the ship, which I did when we were in Moorea. The dive was spectacular – with a special highlight of watching 40 spotted eagle ray swimming slowly against the current in front of us, as if they were on an underwater conveyor belt. And to top it off - I found myself diving with someone who’d booked their flights with one of my colleagues at Travel Nation – what a small world. Our final day in Bora Bora was spent at their stunning private beach. The private island here is smaller than at Taha’a so there was less to explore, but we did take some kayaks and paddleboards out in the afternoon. On the tender back to the ship, we were treated to a fantastic display from the humpback whales as they swam nearby, occasionally flicking their tales preparing to dive. The final day of the cruise visits Moorea and we started the day blissfully; watching whales over a delicious breakfast, then scuba diving! As we swam above the reefs we spotted lemon sharks, black tip reef sharks, turtles and a so many different tropical fish. I can now say I’ve dived in Bora Bora and Moorea which is a lifetime achievement! For the afternoon, several of our group headed to the mainland and hired a car to drive around Moorea itself. We were all amazed by the beauty of Moorea with its jagged peaks, lovely beaches and lush vegetation. If you only have a short stay in French Polynesia, I recommend taking the 2-hour ferry ride from Tahiti to Moorea to explore this island. With more time, I would have loved to explore some of the hiking routes through the mountainous interior. One final sail took us back the short distance to Papeete, Tahiti where we’d started. We enjoyed one final night of drinks and goodbyes before heading off our separate ways. It was emotional saying goodbye to all the crew who were so amazing and really made the trip even better. I hear Paul Gauguin cruises get lots of repeat custom, and I’m sure this is partly down to the lovely, familial feeling on board. 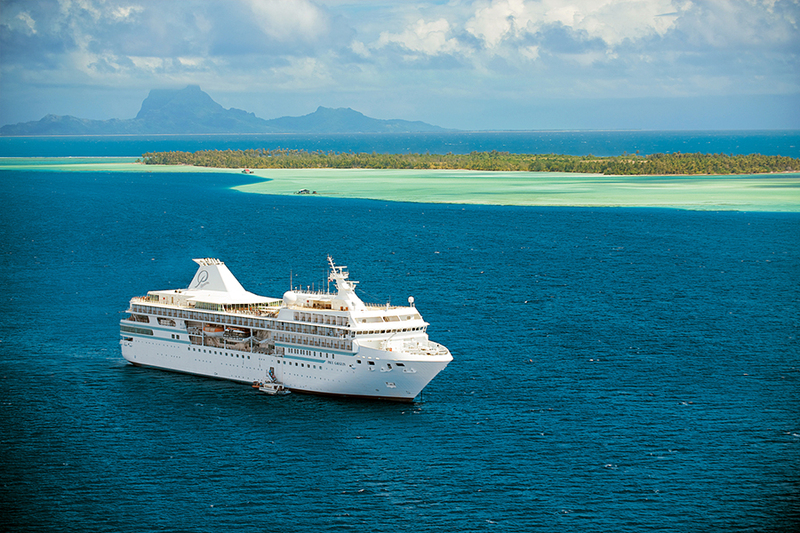 Compared to other Pacific Islands I’ve visited like Fiji and the Cook Islands, French Polynesia is more expensive, but this is where the cruise makes comes into its own. By the time you factor in good 4-5 star accommodation options plus meals and any flights or ferries you would want to take to visit the different islands, cruising is actually one of the most economical ways to see everything. My fellow cruise companions were predominantly older folk, but there were also young couples, honeymooners, families and some locals and everyone seemed to have a brilliant time. After some initial scepticism, I have to say I very much enjoyed my first cruise experience. I wouldn’t cruise all the time, but I’ve been converted to the idea in particular destinations, especially where island-hopping is involved. The cruises I have previously been attracted to were expeditions in places like Alaska, the Galapagos, the Arctic or Antarctica – but this cruise actually had the feel of an expedition cruise too – with luxury on top. Interested in a Bora Bora cruise? 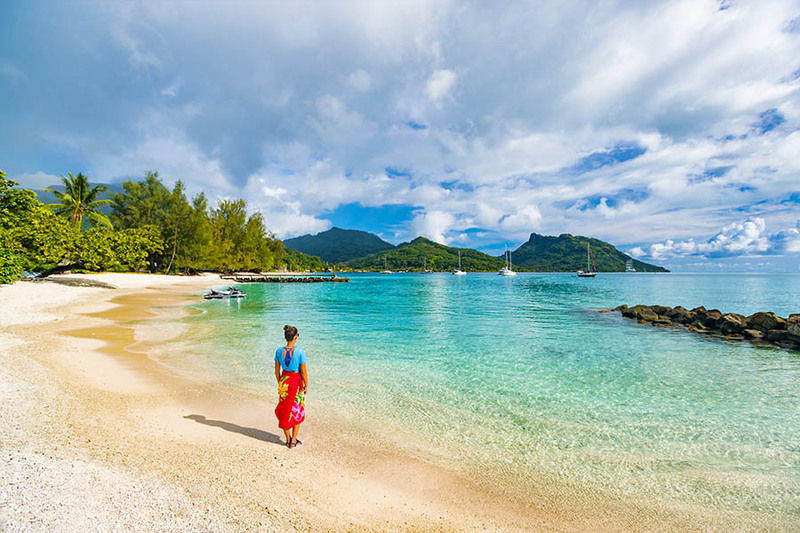 If you’re thinking about visiting French Polynesia and want to book this cruise, I can advise you on the best itinerary and cabin choice to suit your plans. 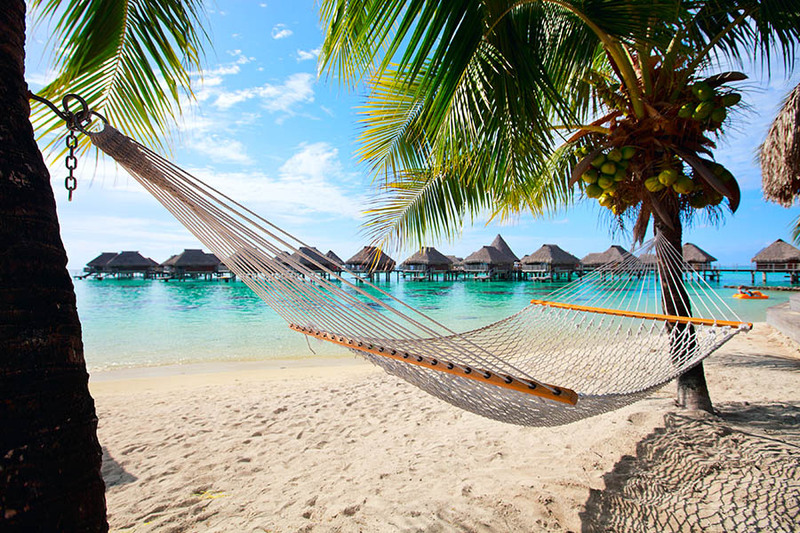 I can arrange direct or multi-stop flights to Tahiti and help you plan all kinds of holidays to Bora Bora and French Polynesia. To start planning your trip, please contact Chris at Travel Nation or give us a call on +44 1273320580.